Close up Magic is usually performed up close with your audience. Often a magician will sit at a table and perform across the table to an audience in front of him (hence the term Close up Magic). Sometimes, he will be standing and performing “amongst” the audience. Sitting at a table will allow you to perform routines that require a table top. You would also have the advantage of being able to use your lap for things (like vanishes- called “lapping” and could also use the table for “loads”). 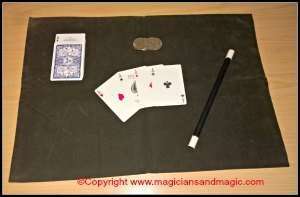 Many magicians would use a close- up mat. Basically, a felt or sponge mat, that helps prevent items from slipping, or the clinking of coins on the table. Using a close- up mat also “frames” your act, making it look more professional. Sitting at a table you would probably be using coins and cards as props. Or, items like salt, sugar, matchboxes and so on (everyday items). In a standing position, you would still use those items. However, you would also be able to use “larger” items like, e.g. rope, ribbon, sponge balls. And, items that I haven’t seen used much lately, like thimbles and billiard balls. Items that would require that you are a bit further away from your audience. Note: Close- up Magic can also be performed on stage. Just because your props are small doesn’t mean that they cannot be effective on stage. I have memories of a very simple card routine, being very effective on stage. The presentation is all important and the volunteers are believed in by your audience. For instance, if you have produced a card that a volunteer says was his, the audience will believe it, even if they can’t see the card. 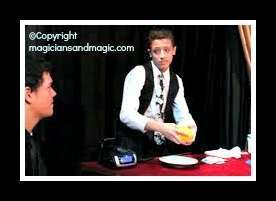 What kind of effects do you perform in Close – up magic? If you are performing amongst a group of people or “table hopping”, you are going to be needing effects that require the absolute minimum of preparation – as they need to be easy to do repeatedly. I think of it as “Wham, Wham, Wham”- “mini climax, mini climax, BIG Climax!“. Thank your audience and always leave them wanting more. What is your role as a close – up magician? You are the presenter of a “story”, the actor and narrator of your own act. What I mean by this is: you are there to “tell/ act out” a story – where the punchline always ends up in Magic. A story ( or patter) will allow you to “routine” your effects with a logical reason for what is happening. (Even if you are not using a story and your effects are of the show stopper type – it makes sense to routine them into a complete whole). Remember, where magic ends up in disobeying laws of nature (vanishing, re – appearing, going through a table and so on) – your audience will end up laughing in disbelief – so close up magic is generally funny and if you have a natural talent for creating humour, all the better – go for it. One last thing – because of the impromptu nature of close up magic – you are going to want to learn sleight of hand. However, I see that most people are using You Tube now, which is easier than learning from books – so that helps. Have fun with your Close – Up Magic. Remember, Everyone wants to be Entertained! I can recommend some great close – up books … coming soon! Here are some great close – up acts… coming soon!